In West Seattle, there are few better places to catch a game. Three miles south of The Junction in West Seattle, a former appliance space that once posted a “VCR repair” sign now houses The Westy, an inconspicuous sports bar that isn’t easy to spot unless you roll your car windows down during game time. Chants of “Sea, Hawks” are heard a block away. Inside, a sea of Russell Wilson and Marshawn Lynch jerseys are amped up for the kickoff against the Steelers. The Westy is arguably the best Seahawks bar to debut in the past 12 months. Good service — or at least as decent as can be when it’s packed like a sardine can — and some deft traffic-controlling prevent a bottleneck at the entrance. Most sports bars serve a truncated menu during the game to expedite service. The Westy serves its full offerings, after brunch service concludes. Those are underappreciated qualities during a game. 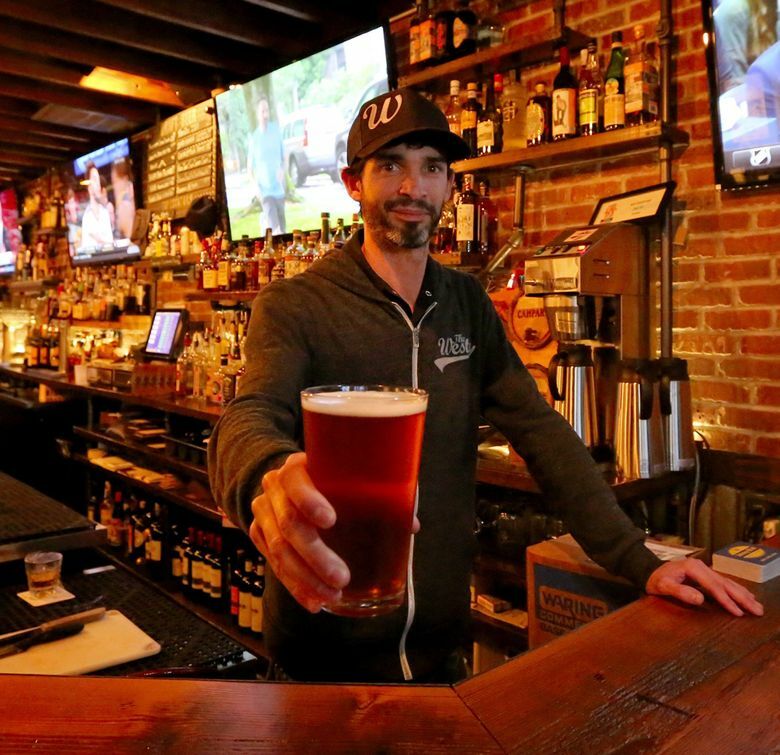 It’s a Cheers-like bar, where the die-hards around West Seattle gather. On this given Sunday, there’s a poor busboy in a retro Lynn Swann jersey going through the 12th-man-gauntlet to get the dishes. “You’re a brave man,” I said. Midway through the first quarter, more fans trickled in, and staff scrambled to find stools. Nearby a server eyed two open seats at an occupied table and told a standing couple, “Let me ask if they’re willing to share their table.” They were. And a bond is formed over Rainiers. It’s as well run as you can expect of a packed sports bar on game day. Jean-Pierre Vidican and business partner Paul Ritums, two old hands who have 30 years of experience behind the bar between them, opened The Westy a year ago. They were outbid on another space, but what do you know? Vidican saw a vacancy two blocks from his West Seattle home. The two pounced on it. The 95-seat bar boasts 18 TVs spread over three sections, each with its own sound system. That’s convenient when the Cougars and the Huskies games are on simultaneously, and the bar doesn’t need to mute either. The food is copious and priced a few bucks less than on the Hill. A substantial buttermilk chicken sandwich with mounds of Tater Tots ($11.50) is enough for two to snack on or dinner for one. Spicy, salty and deep fried, it’s the ideal beer sponge. The Westy is known for its stellar craft-beer lineup (13 taps). But on this game day, after two o’clock, mimosas and Bloody Marys were still the drinks of the hour. It still feels like 9 a.m. for a lot of us, one patron explained. The Westy, 7908 35th Ave. S.W., offers happy hour 3-6 p.m. weekdays and from 11 p.m.-1 a.m. every day. Early happy hour features a $5 bar-food menu and $2 off on beer, signature cocktails and well drinks and $5 glass of wine. Late-night happy hour features food discounts only (206-937-8977 or thewestyseattle.com).